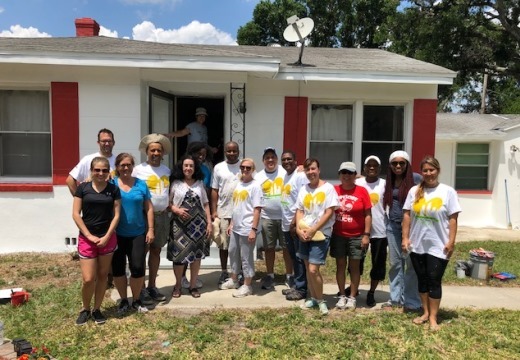 On April 21, a team of employees from Syniverse’s headquarters office in Tampa, Florida, participated in a day of painting and landscape refurbishment to restore the home of a low-income Tampa senior. 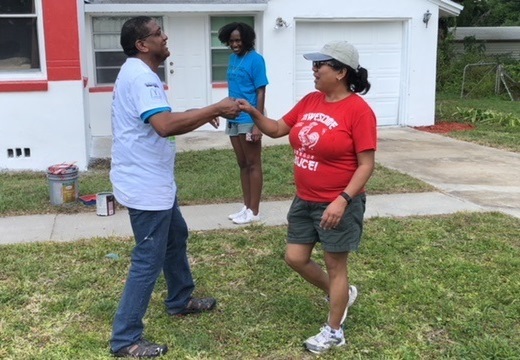 The event was sponsored by Paint Your Heart Out Tampa, a nonprofit that enables citizens, businesses, clubs, and organizations to lend a helping hand to low-income elderly citizens in the Tampa Bay area. 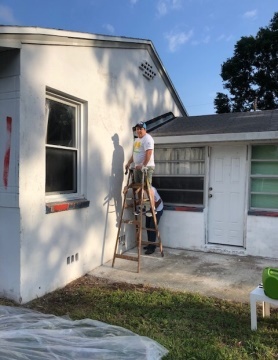 Over the past 29 years, Paint Your Heart Out Tampa volunteers and sponsors have contributed to painting the houses of more than 2,900 homeowners. 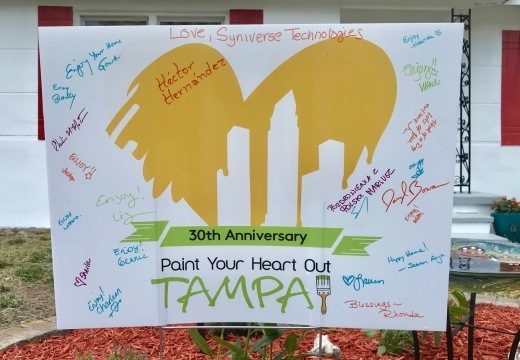 Syniverse is proud to have a long history of participating in various Paint Your Heart Out projects over the years. Our team included 25 volunteers and was organized by our office’s Employee Association. Our Employee Association chapters represent groups responsible for leading charitable and extracurricular activities in communities where Syniverse offices are located. Each year, Syniverse Employee Association chapters around the world identify charitable organizations in their local areas, and then get the input of the office’s employees to select the charities that the office would like to support. Prior to paint day, we cleaned the house with a chemical mix to kill mold, completed some minor stucco repairs, and did some lawn maintenance like edging the sidewalk and patios. 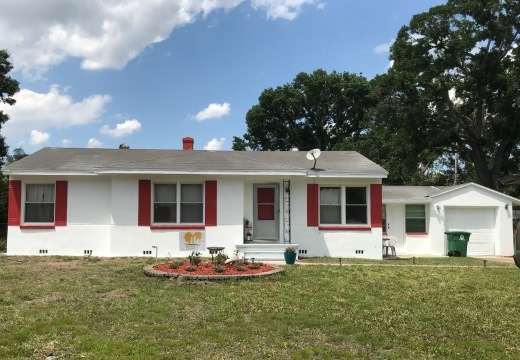 On paint day, we painted the body of the house white and painted the trim, doors, and chimney a red accent color that the homeowner chose. We also did landscaping jobs. 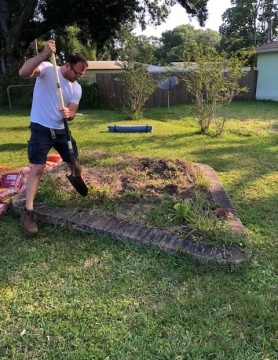 This included clearing overgrown brush from the fence line, removing a dead tree, trimming some palm trees, freshening some flower beds, and installing a bird bath, solar lights, and lawn ornaments. We also created a new herb garden using the homeowner’s plants, and we created a sitting area on the back porch with the purchase of a bistro table and matching chairs, a rocking chair, and cushions. Painting the front of the house. It’s difficult to choose just one. In one way, this project was rewarding because it’s an event that’s dear to my heart and one I’ve been taking part in for several years now. I love being a part of a team of such caring people, all sharing a common goal of helping someone in need. The enthusiasm, dedication and love this team gave to the project is definitely reflected in the outcome of the home; it turned out beautiful. 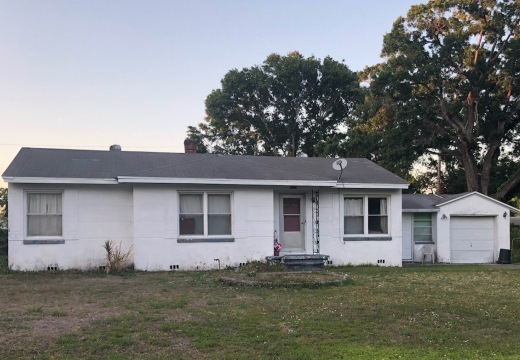 In another way, a rewarding part of this project was witnessing humanity in action and sharing in the joy of the homeowner when she first checked out her newly updated home. It was an unforgettable moment, and an experience that our team looks forward to sharing again in future projects for years to come. A memento from our team. Rhonda Kostka is a Customer Service Specialist at Syniverse's headquarters office in Tampa, Florida.